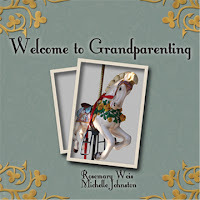 Authors Rosemary Weis and Michelle Johnston are giving away 1 copy of Welcome to Grandparenting to one lucky TwinkieMommie reader as part of Mom Audience’s Giveaway Explosion. The Welcome to Grandparenting book is meant to inspire today's grandparents to actively participate in their grandchildren's lives - from birth through young adulthood - and to foster communications between the generations (i.e., with mom & dad) so that raising the children becomes a happy team effort. The book is full of creative ways to nurture children and enhance this special relationship. For a limited time, purchase Welcome to Grandparenting and save 15% off the list price only at lulu.com.